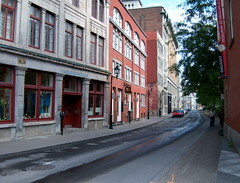 We have a completed photo set from Montreal now available of Flickr. Not a lot of pictures though. Today both Dominica and I return to university for the fall semester. As if we weren’t busy enough! I forgot to mention yesterday that on the drive home I finished “reading” Simon Winchester’s book “A Crack in the Edge of the World: America and the Great California Earthquake of 1906“. The book was excellent just like Winchester’s previous title of which I have read several and Dominica has recently begun to enjoy as well. I got up around five this morning and got ready for work. I am on the early shift this week which means that I have to be up and moving about half an hour earlier than normal which doesn’t sound like a lot but it is already pretty early in the morning for me as it is. The day itself was pretty uneventful. Nothing really special to report. It was a slow day as I expect most of this week is going to be but there was the obligatory backup of work from the three day weekend to keep me busy even though it was pretty slow overall. I left work at four thirty after a ten hour day and drove home in light traffic. I found a kid (probably around twenty) stuck on the side of the road with a broken down car. Right on i78 an insanely busy highway. I gave him a lift to work. He said that he had been stuck on the side of the highway for one and a half to two hours without anyone being willing to stop and help him. He didn’t have a cell phone and no one even called the police for him nor did the police pass by in all that time! Now ask me why I don’t like Northern Jersey! At six this evening I had my very first “Java for Programmers” class online at RIT. This class actually had an “online lecture” and moved very quickly. I am happy with the pace that they are showing in this first class. I am also quite excited that the class is using a highly respected text which also happens to be one that I already own – “Head First Java” from O’Reilly. Dominica got home at seven after going grocery shopping after work and getting us stocked up on supplies. We ordered in Italian from Nino’s and once my class was over we watched a few episodes of Heroes before going to bed. Dominica’s Academic Planning class officially starts today but I don’t think that she did anything with it today. It is not a traditional class so her interaction with the school is pretty minimal.